European skiing is steeped in history and old country charm and topped with modern conveniences. So many ski areas cover Europe that there are almost no unrideable mountains, varying widely from up and coming eastern European resorts to the heart of the Alps. All but a couple countries in Europe host skiing in one way or another. Alpine skiing and snowboarding reaches from Finland to the Middle East at various altitudes, and helicopters provide access to just about any slope that is not lift served. Unlike America, the great European skiing Meccas stem from existing towns that built ski lifts, rather towns that grew around slopes. Many former eastern block countries covertly ran ski areas during the communist era. Since WWII, they have discovered there is money to be made in tourism, and have revealed their skiing gems. Though the northern countries cannot brag about elevation, the cooler climate and snowmaking afford decent snowpack. Boarder countries, between Asia and Europe, enjoy the vistas and skiing in the Caucasus, Altai and Tian Shan ranges, which provide elevations over 3,000m and year round snow. Much like the poorer districts in South America, many resorts lack organized services, modern lifts and in some cases hotels. Desperate to compete with resorts in the Alps, areas like Zakopane, in Poland, are taking measures to improve facilities and equipment, and are becoming increasingly popular. Sacha Baron Cohen’s favorite country, Kazakhstan, draws crowds to Chimbulak with an average of 900 inches of snow annually, covering 99 trails and 943m vertical drop at 3,164m in elevation, all served by eight lifts. The former soviet countries are rumored to have revealed more than 500 resorts all together; however, Poland still harbors some secret ski areas, perhaps while they modernize the archaic lifts. 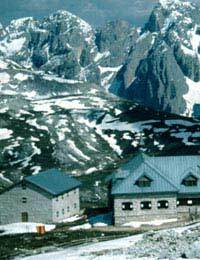 Kirghizstan, Georgia, Armenia, Latvia, the Principality of Liechtenstein and Estonia offer at least one ski area each recognized by travel agents and skiing aficionados. Perhaps it is the draw of the new and minimally touched pistes, or being able to see our history in modern times, but skiing in Eastern Europe is picking up fans. Lost in the glitz of Austria, less known ski countries like the Czech Republic, Croatia, Slovakia, Slovenia, Romania, Macedonia, Bulgaria, Bosnia-Herzegovina and Hungary are vying for tourist visits and money. With peaks around 2,500m high, the Carpathian and Balkan Mountains, and the Dinaric Alps offer wet heavier snowpack, which is good for stability and deep bases. The resorts tend to be small and cozy, with mostly surface lifts, and lines can be shorter, as the crowds spread out over the nearby Alps. Economic instability, proximity to the Middle East, and/or past violence, hinders some resort growth. However, hosting their own national ski associations, and sending skiers to participate in World Cup races and the Olympics is improving reputations as they try to capture the love of their neighbors and worldwide tourists. The water surrounded countries of Scotland, Greece and Cyprus host small resorts perfect for day trips. Despite minimal snowfall, names like Mount Olympus and Nevis Range draw curious skiers and snowboarders and entice them to return with friendly family oriented facilities. Andorra, Portugal and Spain offer skiing in the Pyrenees, but like the afore-mentioned resorts, are plagued by low altitude coastal conditions, which can mean rain. The heart of European skiing lies in the Alps. Modern westernized wealthy countries like Austria, Germany, France, Switzerland and Italy host uncountable ski areas. Only 32% of Austria is below 500 meters, making skiing the national culture and the entire country a skier’s paradise. Furthermore, Switzerland brags of 29 peaks over 4000m. Groomed and off-piste trails of all difficulties converge upon city centers with all the luxuries you can think of, from spas and après-ski to ski schools, ski shops and a multitude of restaurants. Less resort and more entry gate to the entire range, lifts connect towns and kilometers of pristine slopes, opening remote locations to endurance explorers. In addition, the thoroughly developed rail system makes destination areas within reach for weekend trips from any other European nation, taking the “local” ski area to a completely new level. Due to the closely compact mountains and well-designed public transit, the European ski industry is a multi-national culture and economic force. The abundance of helicopter and lift served slopes open the entire region to backcountry and in-bound explorers. Even developing countries have caught on and are working to upgrade outdated equipment, offering undiscovered (by the mainstream) pistes and cultural variety.